DEMO: Store demo unit. Used for demonstration purposes on our showroom floor. Low to no hours. Full manufacturer warranty. 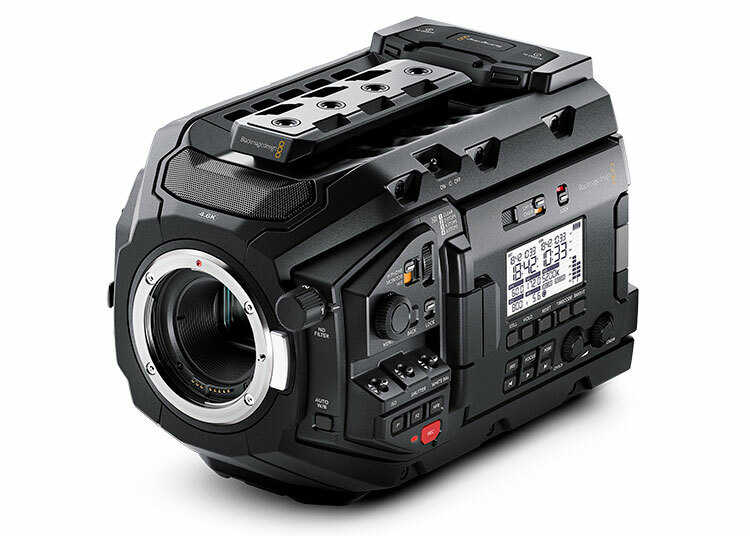 The Blackmagic URSA Mini Pro is a professional broadcast camera with a 4.6K sensor. With a number of new controls and a built-in ND filter, the URSA Mini Pro builds on the successes of the URSA Mini and adds sought-after functionality such as: interchangeable mounts, 3 more stops of dynamic range, and high frame rate recording. 4.6K Sensor. The camera’s 4.6K image sensor captures up to 4608x2592 pixels with 15 stops of dynamic range. That’s three more stops than the URSA Mini 4K. Built-in ND Filter. The neutral density (ND) filters of the URSA Mini Pro are true optical filters with a precision mechanism that quickly moves into place when the ND filter dial is turned — the 2, 4, and 6 stop filters can be displayed as either an ND number, stop reduction or fraction on the LCD. Interchangeable Lens Mount. The URSA Mini Pro comes standard with a Canon EF lens mount, but has optional mounts for PL and B4 lenses for a moderate price. Advanced Colorimetry. URSA Mini Pro features an incredibly wide color gamut that captures more of the visible color spectrum than Rec. 2020, which is vastly larger than the P3 digital cinema color space! Third generation Blackmagic Design color science is used to process the raw sensor data, enabling amazingly rich skin tones, natural color response and enormous amounts of dynamic range. Whether you’re shooting a Hollywood blockbuster, an indie film, high end commercial, or a broadcast television show, URSA Mini Pro’s combination of resolution, dynamic range and color gamut delivers amazingly rich and lifelike images! High Frame Rate Recording. URSA Mini Pro can shoot at high frame rates and then play it back at the edit frame rate so you get smooth slow motion video that’s crystal clear. You can set the camera’s default shooting frame rate and also specify an “off speed” frame rate. Switching between them is simply done with the touch of a button on the outside of the camera, making it incredibly fast to switch between standard and high frame rate shooting! URSA Mini Pro can capture full resolution 4.6K recordings at up to 60 frames per second! Non Stop Recording. URSA Mini Pro features both dual C-Fast 2.0 recorders and dual UHS-II SD card recorders so you can choose the media that works best for you. C-Fast cards are ideal for full resolution RAW recording, while SD and UHS-II cards are inexpensive and commonly available, making them perfect for recording ProRes Ultra HD files or RAW HD files. Simply choose the media type, insert the cards and start shooting! With dual slots for each media type, you never have to stop recording because when the first card is full, it automatically continues onto the next card. You can even swap the full card for an empty one, all without having to stop recording! URSA Mini Pro can record lossless 12-bit CinemaDNG RAW files for the highest possible quality, or 10-bit ProRes files for easy post production workflows with minimum storage requirements! Built in Monitoring. The built in 4” fold out touchscreen URSA Mini Pro and the 5” fold out touchscreen on URSA Mini are super bright, high resolution color displays with a wide viewing angle that makes them perfect for monitoring and reviewing shots on set! The screen can also show you a “heads up display” overlay with critical information such as format, frame rate, timecode, ISO and more. You even get a histogram, card recording status indicators and audio meters! The fold out touchscreen lets you use the incredible new URSA Mini operating software so you get super fast access to every camera function, ATEM broadcast switcher integration features for live broadcast, digital slate for metadata management and more! Advanced URSA Mini Software. 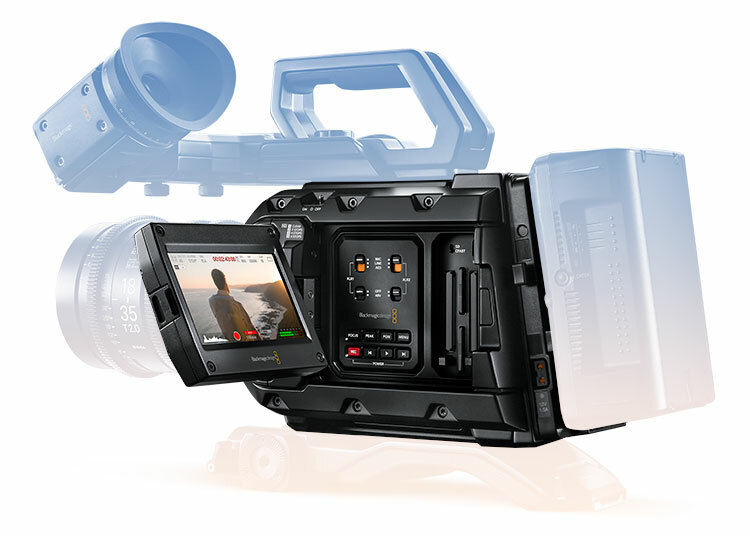 All URSA Mini cameras feature a new user interface that revolutionizes the way you work! The advanced camera operating software lets you use simple tap and swipe gestures to control all features, setup, the digital slate and more. You get powerful and super fast software with a unique heads up display that puts commonly used functions at your fingertips. Simply touch an on screen icon to make changes for things such as audio levels, white balance, shutter angle and more! You’ll instantly see sliders and controls for making adjustments without ever having to navigate through any menus! The new digital “slate” makes entering metadata faster than ever before with a built in dictionary, predictive entry and on screen keyboard. Using a professional digital film camera has never been faster! Highly Customizable. Blackmagic URSA Mini cameras are completely customizable so you can create a rig that’s built specifically for your production! You can add accessories like the Blackmagic URSA Viewfinder, URSA Studio Viewfinder and Blackmagic URSA Mini Shoulder Kit, or choose from hundreds of third party accessories. URSA Mini and URSA Mini Pro have 9 standard ¼” threaded mounting points on the top and bottom of the camera so you can mount it directly to a tripod as well as add accessories such as rails, sliders, matte boxes, microphones, ring lights, batteries and more. Whether you’re building a feature film rig or outfitting the camera for an ENG style shoot, URSA Mini has all of the mount points and connections you need! High Resolution Viewfinder. The optional Blackmagic URSA Viewfinder is designed to be the perfect match for URSA Mini Pro and URSA Mini cameras. You get a high resolution 1920 x 1080 color OLED display matched with precision glass optics, adjustable diopter and built in digital focus chart so you get perfect focus every time. To preserve OLED screen life, there’s a built in sensor so the OLED only turns on when you’re looking through the viewfinder. The Blackmagic URSA Viewfinder is adjustable so it can be used on both the left or the right eye. There’s even a built in record light! Blackmagic URSA Studio Viewfinder. The URSA Studio Viewfinder is a true professional viewfinder for URSA Mini Pro and URSA Mini. You get a bright 7” screen with large handles and variable tension pivot points that let you smoothly adjust the viewfinder’s position and angle, even while you’re live on air. The tactile knobs and buttons give you direct control of settings so you can keep your eye on the action! Combined with the new software update for URSA Mini, the URSA Studio Viewfinder turns your URSA Mini into the ultimate live production camera! You get support for talkback, tally, and program return, along with remote control of focus, iris, color balance and more, all from your ATEM Switcher! Professional Connections. 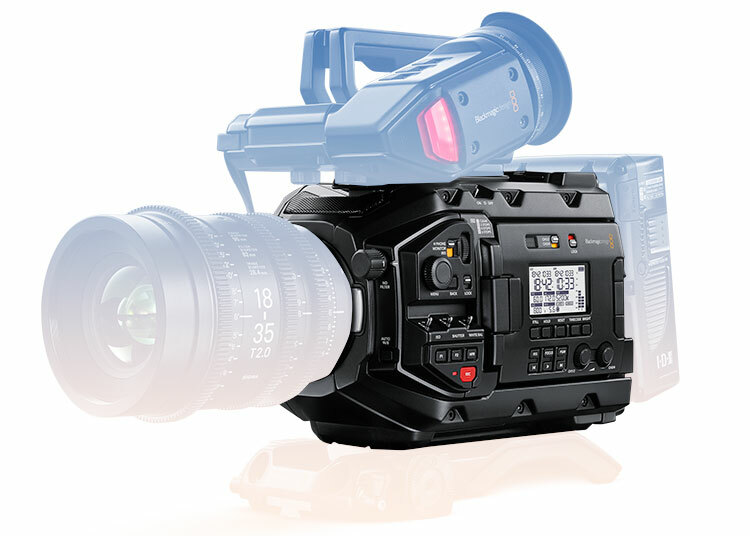 Blackmagic URSA Mini Pro features multiple connections such as 12G-SDI out, HD-SDI monitoring out, 2 LANC inputs, balanced XLR audio with phantom power, timecode in and reference input. On the front right side of the camera is a 12 pin Hirose control connector for broadcast lenses. There’s also a 4 pin XLR DC and an HD-SDI monitoring output that are located in the perfect position for connecting an optional viewfinder or on set monitor. The 12G-SDI output handles all formats up to 2160p60 using a single BNC cable, and also switches to 6G-SDI or HD-SDI depending on the shooting format. Advanced 12G-SDI. 12G-SDI is an incredible 8 times faster than regular HD-SDI which makes it fast enough for Ultra HD video at up to 60 frames per second, all over a single regular SDI cable! The high quality BNC connections are multi rate so it can automatically switch and work with 6G-SDI, 3G-SDI, and regular HD-SDI equipment. That means URSA Mini Pro and URSA Mini are compatible with all of your existing HD and Ultra HD equipment so you can plug it into things like ATEM live production switchers, on-set monitors, decks and more! Professional Audio. URSA Mini Pro has a high quality microphone and professional audio recorder built right in so you don’t have to carry around extra sound equipment! Use the built in stereo microphone to record natural location sound or connect professional microphones using the two XLR wide dynamic range mic inputs. The XLR connections have 48V of switchable phantom power so you can plug in everything from shot gun to wireless clip on mics for capturing every detail of the performance. You can quickly adjust levels using the external knobs and monitor audio using the onscreen audio meters. Digital Slate. The built in touchscreen makes it astonishingly simple to set up and enter metadata for tagging clips. Metadata is saved directly in the video files so you don’t have to worry about managing extra sidecar files. You can import the files directly into software like DaVinci Resolve, Final Cut Pro and Avid Media Composer then use the metadata to sort, search and find the clips you need so you can spend more time on creative editing and less time managing mountains of media! Flexible Power. URSA Mini Pro and URSA Mini cameras include a 4-pin XLR industry standard power connector that works with 12V to 30V external power supplies. That means it’s easy to use the camera with all of your existing power supplies and batteries! All URSA cameras use the same battery power connector and mounting points on the rear of the camera so you can use a wide range of battery plates from manufacturers such as IDX, Frezzi, Anton Bauer and more. You can also add the optional Blackmagic URSA VLock Battery Plate for using popular V-Mount batteries. Includes DaVinci Resolve. All URSA cameras include a full version of DaVinci Resolve Studio. DaVinci Resolve Studio is editing and color correction software that features an advanced, multi layer timeline with powerful editing and trimming tools, along with Hollywood’s most advanced creative color correction and creative grading tools! With URSA Mini Pro and DaVinci Resolve, you get a complete post production solution so you’ll be able to shoot amazing images with incredible fidelity, color and dynamic range while retaining every bit of quality. Whether you’re working on a major feature film or a YouTube video, DaVinci Resolve Studio gives you a completely lossless workflow for native editing, color correction and delivery, so your video always looks as good as possible!